Adobe's PDF format has taken the world by storm, allowing the rapid distribution of documents over the web in a form that is platform-independent but rich in layout and formatting opportunities. The only drawback? Unless you have access to special software packages that have prices in the triple digits, there's really no way to edit PDF documents. That is, until e-PDF came along. e-PDF gives you full control over all of your PDF documents. 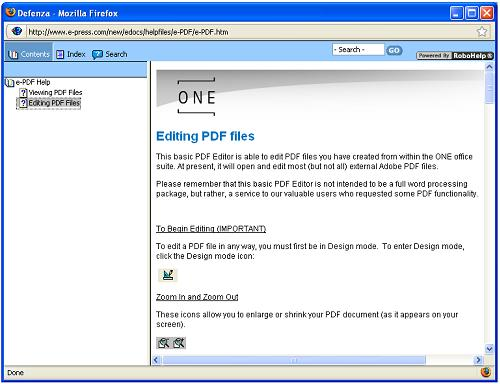 Using e-PDF, you can create, view, print, and edit any PDF document that you can get your hands on. e-PDF's advanced editing features allow you to insert, move, and resize images, add comments, add bookmarks and links, and add text in a variety of colors, fonts, and sizes! So grab yourself a copy of e-PDF, and unleash the full potential of the PDF file format today! Create, view, print, and edit PDF documents. Insert, move, and resize images. Create bookmarks and links in PDF files. 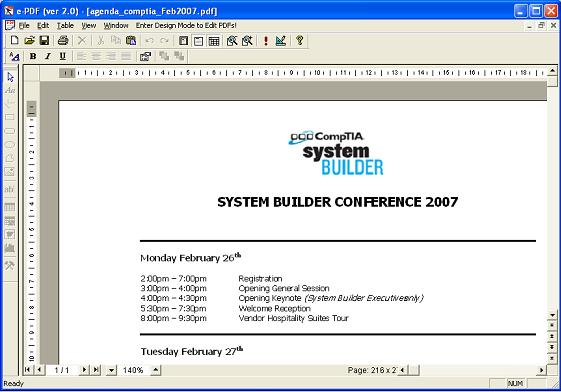 Add text to PDF files, with full control over text color, font size, font selection and more. Mike G I purchased e-PDF on Bits du Jour when it was offered in May 2009. How can customers determine when a new version is available? I haven't been able to locate within the program or on your website any means of determining if updates are available . Also, I didn't see any release notes for current or past versions. Is it possible to at least add a FAQ entry indicating the version available for dowload? Thanks for your email. The version being offered is the same. We are doing it again because of the high demand I've been getting. Peter Gilkes I have downloaded the .exe file but it does not run - I have tried this on two computers without success. Don't know what the problem is. Others have downloaded without any glitches. I sent you an e-mail with another URL to download form. See if that works and please get back to me. I think that the payment processing is having problems - I did the Paypal payment and it was successful, but when it is done it just links back to the e-press.com site root (www.e-press.com) - not anything that refers to the cart entry I was working from, and I have not received any follow-up emails to confirm that it was processed on your side. I have emailed you before with similar behavior with the e-barcode software that we never resolved. Luckily I am quicker catching it this time. I would like to find out if it can also convert MS word 2007 to pdf. Because I tried but didnt succeeded. Thanks. The payment processor is working fine. At times, it may take a couple of hours to get the return e-mails as there is a lot of traffic due to demand. Sorry for the inconvenience. Just paid for one copy via PayPal (Order# 53793) (as my VISA card couldn't be processed for some unknown reason) but the redirection to https://www.e-press.com/ from PayPal failed. David Vital Installed the try before you buy option, and the program prompts for a license key just to try it. What happened to the try before you buy option? You should have recieived your instructions and reciept by now. If not, please let me know. When you order a trial version, an email is sent to you to register. Once you do that we send you the download trial URL and a login and password. It is through that login and password that you are bale to activate for 30 days. I had purchased 10 licenses for this software; but in different occassions, the installed machines were formatted and since then the given license numbers are not working. I have sent an e-mail to get help from you. Please guide me to get te license back.